As I'm writing this it's currently a massive flood in my town. Basements are filled with water, roads are flooded, some roads are even cracked up and rivers are appearing everywhere. Supposedly the rain will end around noon tomorrow, and then we will have great weather during the weekend. On that occasion I found it suiting to finish up this post that I've been thinking about for a while. Well, this post won't be about storms and bad weather, for that you can see my post "Why Bad Weather Could be Good for Your Creativity". Today I'll be writing about getting into the water and how this may better your photography. As photographers and photography enthusiasts we do our best to create something unique. To find interesting perspectives and compositions. Finding interesting perspectives might be the biggest challenge with photography. We tend to find a comfort zone and stick to doing what we know works ok. But why settle with just ok? Let's try to be creative and create something better than just ok! Getting into the water might be the little ekstra your image needs. It might be more tempting to get into the water when you're photographing tropical locations rather than arctic, but with the right equipment and attitude it is worth it! As I've mentioned there are many reasons why you would enter the water. Primarily it is to get a interesting perspective and often a strong composition. You don't have to stand with water to your stomach, sometimes ancle deep is enough! Let's look at a few occasions when the water was essential for my photo. In this first example I was standing knee deep in the ocean, capturing the motion of the waves as they surround the Botany Bay trees. This image could work without any water too, but the waves create a much more interesting scene. It's like the scene is now alive. Capturing shots like this is always a bit challenging tho, as the shutter speed is close to a second, you need to really press down your tripod and make sure it's stable when the waves hit you. From tropical heat to arctic cold. This waterfall photo was both a pain and pleasure to create. I decided to get into the freezing river as I knew this would give a unique perspective. There was only one way to figure out if the perspective would be good or not, and that was by trying. I got into my waders and walked up the river about knee deep. The biggest challenges in here was the constant spray from the waterfall that became ice only seconds after touching my camera, the strong currents and the freezing cold. At moments like these, the negative aspects tends to matter less, as all that's in my mind is creating a good image. For this last example I barely got wet at all. I. Fact I was in between balancing on rocks and standing with water to my ancles. Even tho this is a scenario your not deep in the water, the fact that I went out balancing on the rocks turned the picture into a greater shot than it would have been if I was standing on land. Why? Because the foreground is much more interesting now that I'm surrounded with water. 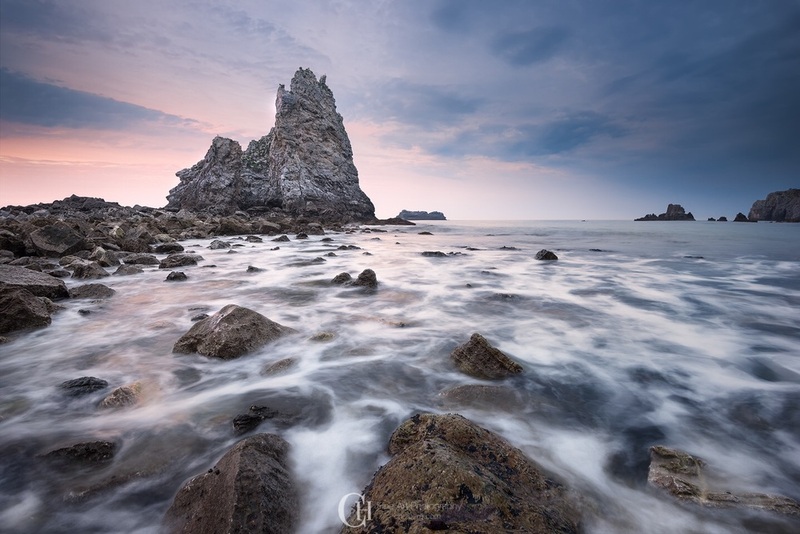 The long exposure ocean creates a good foreground, rather than just having some rocks, then the ocean behind. Yes, getting into the water will often give a good result. Yes, getting into the water could be dangerous. Like in any other situation you got to be aware of you're surroundings. Be cautious and be clever. Water is always a scary element, either your in the ocean or a river. The currents can be strong, and if in the sea you need to be aware of the tides! I've had some close calls with the tides, and I've heard horror stories with people getting stuck and having to swim back. You don't want that to happen with you. When you are in colder areas I strongly suggest using waders. This is to avoid freezing, and in some situations you want to avoid being wet at all too. Waders are great in those situations. Waders are also perfect when you are walking up rivers. Gaters are perfect when shooting seascapes, as long as you're not planning to go deep! They are great to use when you're standing where waves splash, as they keep your legs dry. As in any other situation, common sense is crutial. The image above is a great example for where gaters would be good to use. Since the waves are crushing in front of me, water could go up to me knees. Waders aren't necessary as you're not going in the deep!